Chuo Park Avenue in the heart of Okinawa City is a strip mall distinguished by white sphere-shaped roofs covering both sides of the street. The area was called Koza for a long time. When Okinawa was under the administration of U.S. Armed Forces, the street was called B.C. Street. The area originally grew up to become a business center catering mainly to the U.S military, and the B.C. in its old name stands for business center. At the time, although officially integrated the U.S. military was in practice racially segregated, and B.C Street was catering almost exclusively to white customers. Koza used to be divided into two separate areas, one catering to the whites and another area where almost all Americans were black. Both were crowded with military customers, and become important centers for the livelihood of local people. After Okinawa’s reversion to Japan, the B.C Street area was renovated in mid 80’s and renamed Chuo Park Avenue. Some old residents are still calling the street the Center Street, perhaps for a sense of nostalgia. 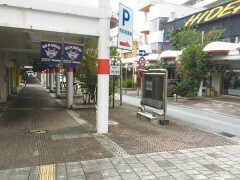 There are still some restaurants and shops on this street that sell mainly to American soldiers.